If you haven't seen it yet, check out the new issue of CQMagOnline, which is now up. There is some great stuff in this issue! Of course, I am partial to the article that Lynn wrote about AAQI and my little quilt I donated. Another article that I am taking as a challenge is Julie Hocking's "Its All About Scale". She has made a fantastic miniature crazy quilt. I have been thinking about trying the same type of project since my friend Lorna has been sharing her passion for dollhouses and minatures with me. I have gone as far as to dig out a kit for building a dollhouse from my stash. Of course the doll house is just a means to an end! I can't wait to start making all kinds of minature needlework to go in the house! Looking at Julie's wonderful quilt and seeing the techniques she used is really inspiring me! It was also exciting to read what Leslie wrote in an article about the Making Memories quilts made by CQI members - this project is a real joy to work on and seeing the finished quilts is so exciting. Instead of reading about what I like about each wonderful article though, head on over and read them all for yourself! I finished embellishing this block for Cathy in the Pansy DYB (Do Your Block) Round Robin at CQI. I chose this block to work on because I loved the colour combinations. The first thing I did on this block was the purple butterfly in the corner, the one from the tutorial the other day. I had two gorgeous little pansy buttons/beads so I built a seam treatment to highlight them. I dyed a piece of lace trim with Adirondack alcohol inks to go along the pansy patch at the bottom right hand corner and attached it with translucent purple seed beads. The pansy appliques in the bottom left hand corner and along the right hand side were cut from a gorgeous piece of pansy ribbon I have been hoarding and I used Steam a Seam to attach them and buttonhole stitched around with Balgers braid in a gold/silver mix. The button cluster I built because I wanted to use of my glass Czech buttons, the green one, and the other buttons are shell and a vintage glass button. I also added a couple silver beads and crystals to one of the shell buttons. The ribbon alongside the button cluster is some of a beautiful pansy coloured ribbon from Piecemakers that Marya sent me awhile back. I am definitely getting better at using some of these little treasures instead of hoarding them all! I put some more work into making a velvet pansy for this block andc I think the results of these are improving as I work on my technique! If I do another on the next Pansy block I will do a tutorial as I go along. I really enjoyed working on this block, the colours just called out to me and I adore pansies so it was a lot of fun to work with this theme. Hopefully Cathy will like what I have done on her block. Here is the butterfly tutorial as promised. I keep making small changes in the way I make them so all I can say is that this is the way I made this one. First you will need some fabric with realistic butterflies repeating in the design. As you can see, I have already used this fabric once before. Cut out two identical butterflies from the fabric. These are rough cut - you will need to cut them out closer following the outline of the butterfly, clipping in the corners. Or you can wait until you have stitched them together first before trimming them and then you will not have to contend with problems with the fabric fraying. Here is where I detoured this time. Usually I would pin the two butterflies with right sides together, matching them up well, and then stitch around most of the edges, leaving a space for turning. Then I would turn it right side out and use a ladder stitch to close the hole. Turning the little wings can be pretty fiddly. Instead this time I decided to press the excess under the wrong side of the butterflies. In one I basted the edge over before pressing. On the other I used a glue stick. I have recently watched Judith Baker Montano's DVD and decided if glue stick is good enough for her, it is good enough for me! I pinned the butterflies with the wrong sides together and used a ladder stitch to sew the two butterflies together. This did away with having to turn it. Once it was sewn together there were stitches showing since I used white thread and a few places where I did not get the black edges of the butterfly matched perfectly. Using a black pigment marker made it an easy fix. I just coloured the white threads and little white edges black. Worked like a charm! The butterfly is then sewn down on your background fabric with a simple seam up the middle of the body, leaving the wings free. I used seed beads to make a body for it and added black thread for antennae. And here it is from the side view. I have been following your blog for about 1 week and I love it! If you will send me your mailing information I will get this right out to you! If you need a reminder, last week's giveaway items were the current issue of A Needle Pulling Thread (a great Canadian needlework magazine), The Floral Elegance Any Year Diary, and the Blessings Journal. This week I celebrated my birthday so will keep celebrating with another giveaway. For this week's giveaway, I dove into the stash and came up with a variety of complete kits of one kind or another. The first kit is this Winnie the Pooh cross stitch kit. Everything is included - originally I was thinking it would look cute done up on a jean jacket using waste canvas. Or maybe a birth sampler if you replaced the words on the border with the baby's name etc. The third and final item is a lovely needlepoint kit by Dimensions. I love this but somehow I don't think I'll ever get around to doing it. Here is a closer photo of the needlepoint picture - I think it is so pretty! So that is the giveaway for this week. Three items - winner takes all! 1. For one entry leave a comment telling me what project you would like to start next or something else - maybe what project you are working on right now or something you are getting close to finishing. 2. For a second entry, become a follower or let me know you already are in a separate post. 3. For a third entry, blog about this giveaway and leave me another comment with a link to the post. Please, please, please leave me an email or a way to contact you so I can give you your prize! I am happy that I have got back to stitching after being stalled for so long. This is one of Cathy's blocks in the Pansy DYB round robin at CQI. DYB stands for Do Your Block - each person in the round robin makes up six blocks, each six inches square, and as they come around each of the other five round robin participants completely embellishes an entire block. Usually when you get your blocks back there is an empty one left for you to work up but in this case we have decided to each do some work on the 6th block so that it is complete when it returns home to. So, that is why this one is the "shared block". Carolyn was the first to stitch on Cathy's blocks so she chose this one to be the shared block and added the purple beaded seam and the gorgeous dragonfly. I added two seams - the herringbone/cretan stitch combination and the light mauve sheaf stitch one. I also added this little butterfly motif to keep Carolyn's dragonfly company. I love these butterflies made from fabric and I am very happy with the way this one turned out so I think I will make another on the block I will be embellishing entirely. I thought I would do up a tutorial as I work on the second one as well and will post it as well as the work on the other block in a day or two. Here you can see how I attempted to take a photo (somewhat successfully) that would show the three dimensional effect of the butterfly - this is what makes it so much fun! I have to thank Janet for originally sharing this technique with me - I have had a ball with it ever since! Check out Janet`s blog for more great crazy quilting inspiration! By the way, if you have not entered this weeks giveaway yet, scroll down a couple posts and join the fun! Well, here it is.... the infamous dishcloth that I was making in an attempt to wake up my muse! I think it worked, actually, since I am back to stitching at last! You may notice that I managed to mess up this simple pattern - got turned around - but kept on knitting anyway. The purpose of this little project was to discipline myself to get some handwork going again. All the mistake means is that the finished dishcloth is destined for my sink instead of someone's Christmas stocking! 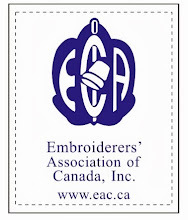 First of all, congratulations to Nicki Lee, who won this week's giveaway of the assorted threads! I used the randon integer generator and up came her number! I already have your address, Nicki Lee, so I will get the threads and the little charms out to you right away. Since this week I am celebrating writing posts for my blog and your reading them, how about reading and writing materials for a prize? 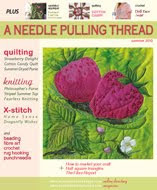 First of all, the current issue of A Needle Pulling Thread! This is a magazine that has been around since 2006 and I have been hooked since the first issue. 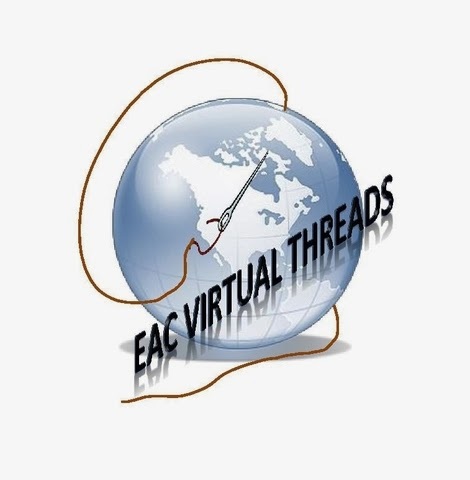 A Needle Pulling Thread celebrates Canadian needle arts and covers a diverse spectrum of needle and fibre arts: quilting, fibre art, knitting, crochet, cross stitch, rughooking, embroidery, beading, creative sewing and more! If you would like to check out the magazine, visit their website. Samples of what is in this particular issue can be seen here. The second item in the giveaway is a lovely girly datebook, suitable for any year. The third item in the giveaway is a journal for counting your blessings. Doesn't that fit in perfectly with the whole idea of celebrating whatever you are thankful for each week? In this case you can make notes of your blessings every evening. And look, if you turn the journal over, you can do the same during the day. 1. For one entry leave a comment telling me what your favourite form of fiber and needle arts is right now or what you would like to try next. Just a note to say thank you to everyone who commented on my post about my missing muse! I am taking all your advice to heart and am sure I'll have a needle and thread in my hands again soon. I did read a novel since then - a bit disappointing since it was so darned predictable - but entertaining nonetheless. Much more interesting was the reading material that came in the mail! Every quilting magazine seems to have at least one project I would like to make in it. I know, I know, I am not a sane quilter, but one day I would like to be! Pieceworks is always a wonderful, substantial read and I was delighted to see Pat Winter`s entry in the annual contest. Pat`s entry is a purple crazy quilted heart (hearts were the theme for this year`s contest) and her entry certainly deserved the recognition it received. I have lusted after Mary Web`s Embroidery Stitches book for some time and finally treated myself to a copy! After Gayle shared her first Kanzashi flowers at CQI, I simply had to learn more about them! So, I am happy that my copy of Kanzashi in Bloom has arrived for me to read. Kanzashi are flowers created from folded fabric and are the flowers in geisha's headpieces you may have seen in photos. What can I say about these patterns? I hope to bead some of these ornament covers - whether I ever will or not I do not know. Some of these are actually labelled beginner though so there may be hope! I spent a whole day running errands or at home catching up on laundry and doing what I could to ease dh's housework load there. He certainly appreciated coming through the door and finding a homecooked meal on the table, with enough leftovers to take for his lunch the next day. Poor man is on a 16 day stretch of no days off and ten, eleven or more hour days. When you add the 2 hour commute to that no wonder he is tired out. Just as well that I have enough to keep me out of his way when he is this tired and busy. So, I was delighted when my materials arrived in the mail for the EGA stumpwork correspondence course, Honeysuckle and Hummingbird! The next package I opened contained Cathy's set of DYB blocks from the Pansies round robin at CQI. Another project and better yet a project with a deadline: just what I need to bring my muse out of hiding and put her back to work! I can't wait to get started! So often you order something online and it doesn't meet your expectations. These charms exceeded my expectations for them! I had thought they were not what I wanted but I could make do. Instead, they were exactly what I wanted! As if that wasn't enough, I received a wonderful gift of cq goodies from Aida! Look at all the luscious stuff she sent me - thank you Aida! I especially love the threads and beads and the blue fabrics are perfect for a project I have bubbling around in the back of my head (more on that later). This was absolutely my favourite of all the fabrics Aida gifted me with - isn't this the most wonderful colour of dupioni you have ever seen?! And yes, the mandatory puppy photo! lol Little Bear has managed to find a cozy safe spot to nap. It is a little carpeted ledge way under the kitchen table in the trailer, I think it accomodates the wheel well. Obviously I don't get under there to clean often! I do so like the way these little guys lay out with their legs straight out behind them - it reminds me of a little seal when they lie like this. And last but not least, here is the start of my dishcloth. It is helping me to get myself back on track and wake up my muse. Although it is not very creative just following a simple knitting pattern, it is helping me discipline myself to get back to handwork. With the inspiration from the new reading material, new projects to work on, and all your support I am slowly getting my cq mojo back. Thanks for your help! Friday Giveaway - Last Week's Winner & a New Giveaway! The winner of last week's Friday Giveaway of the current issue of Spin Off magazine is Marilyn! lol - an easy win for Marilyn since she was the only one who left a comment. Marilyn didn't leave an email so I would ask her please to contact me - just leave a comment with your email and I will email you right back to get your mailing information. (I will not publish the comment with your email) If I don't hear back from you by next Friday I will include the magazine in with the prize for next week. Last week I asked for comments suggesting what would make a good giveaway item in the future. Since Marilyn's suggestion was the only one, I will take it! So, this week I will be giving away some specialty threads as Marilyn suggested, along with a package of these great clock charms I just received in the mail. Aren't these great charms? When I found them I bought all that there were in stock, five packages, so I have enough to share with you as well as a package for a little surprise for my miniaturist friend, Lorna. I am sure she will find a creative way to use them! As for me, timepieces speak to me about Alzheimer's Disease - time for a cure, time slipping away, etc., so I am sure they will find themselves on one of the AAQI quilts I will make in the near future. This has been my favourite thread to use for seamwork for almost a year, Gloriana Princess Petite Perle. It is a gorgeous hand dyed silk thread that is lovely to work with. You will get one skein of this thread in Highland Garden (Dark). Since I discovered Valdani Pearl Cotton recently, it has become another favourite of mine. I love the varigations. This particular one is a very subtly variegated green and the thread is size 12. This is another thread I love for seam treatments. These five assorted types of thread by Rainbow Gallery. Patina is 100% rayon and this one is a gorgeous slate colour. Next up is Arctic Rays in a soft pink. It is a sparkly, frizzy nylon thread that is lots of fun. I have made dragonfly bodies with Arctic Rays as well as using it in cross stitch to make things I wanted to have more texture, like snowmen or mittens. Bravo is a strandable 4-ply cotton. One ply is equivalent to #12 perle cotton. Again, you can see I'm a sucker for varigations. Razzle Dazzle is a very sparkly metallic thread. It is quite thick so would be fun to couch down. Gold Rush is another metallic, in orange this time. Just to round things out, how about a skein of DMC #5 Cotton Perle? This is thicker than I like for stitching seam treatments but if you use your imagination I am sure you will find a use for it. Last but not least, these are some of the silk threads that a friend brought me back from a trip to China. The colours are very vibrant but you need smooth hands to work with these. They are too delicate for me to work with while I am working in the campground in the summer. I said that I would give a reason I am celebrating with a giveaway each week. This week I am celebrating my AAQI quilt being selected for the Alzheimer's Illustrated: From Heartbreak to Hope Exhibit. What are you celebrating? 1. For one entry leave a comment telling me what you are celebrating this week - the summer weather, a happy accomplishment, a birthday or anniversary or whatever! Counting our blessings is always a good thing so let me know one of yours! I got an exciting email this morning from Ami of Alzheimers Art Quilt Initiative - my first AAQI quilt has been chosen to travel with the "Alzheimer's Illustrated: From Heartbreak to Hope" exhibit. The 53 quilts chosen will hang in between quilts made of 10,000 purple name patches that honor individuals who have/had Alzheimer's (or a related dementia) in an exhibit called "Alzheimer's Illustrated: From Heartbreak to Hope." It will begin traveling in January 2011. My Aunt Olive is one of the ten thousand names. The plan is to sell all the quilts in the exhibit when it retires. For a limited time you can see the quilts selected at the link above. Not only that, but when I visited the new Alzheimers Art Quilt Initiative Update blog, the header at the top of the page is part of my quilt! How exciting is this?! I was honoured to create this quilt for AAQI and dedicate it to my beloved Aunt Olive who is struggling with this awful disease. Just a reminder too that tomorrow is the last day of AAQI's July Slow and Silent Auction - please take a moment to check out the quilts for auction, as well as all the other quilts currently being sold to raise funds. There are some really lovely quilts made with all types of techniques! I hate a post with no pictures so here are the puppies together. The new puppy, Bear, sleeps contentedly with the old girl, Nala. I think it is a relief for Nala when the puppy runs out of steam and falls asleep. Bear's favourite game has become grabbing a big mouthful of Nala's fur and playing tug of war. She has a bit in her mouth in this picture - at the rate she is going she will get hairballs! Subject for today is a question - what do you do when you hit a dry spell - when your muse flies the coop and you just don't feel like picking up a needle and thread? One day leads to the next and before you know it a week or two have gone by and you haven't taken a stitch. That is where I am right now. Initially I had reasons: the wedding, company here, busy at work, etc. Now I have excuses but no good reasons. I have just fallen into a slump. I can't seem to bring myself to take the first stitch and do my fifteen minutes a day minimum that I know will get things flowing again. So, does this happen to you? What do you do when it does? I would sure like any help you can give me or advice that will get me back on track! I have tried surfing the net and getting inspired by all the eye candy on the blogs and I have seen lots of things I would like to try.... sometime.... but apparently not now. I think today I will try an old cure on myself. I am bundling up a ball of yarn and needles and will try to knit a dishcloth today in the spare moments of my day. Somehow making something I don't have to think about seems to help as well as having a finished project of any kind done. I am hoping it will break the spell and get me moving again. I can't remember ever having so many off topic posts here before - thanks for your patience and hopefully I'll have something stitched to share soon, even if it is a dishcloth! Hopefully this week I will get back on track. With my son's wedding, the long weekend at the campground, my granddaughter visiting for a week, the new puppy and the whole family here on the long weekend, I haven't had a moment to myself it seems. Added to that my internet is acting up supremely so that doing anything online takes hours and it has been hard to find moments for stitching. But this morning it is just the dogs and me left here at the trailer, the campground is almost empty and once I finish mowing and cleaning up there should be room to breathe. So, in the meantime I would love to share some of the wedding pictures. DD, Katie, was a bridesmaid, and here we are, both looking very happy obviously! This is Bobbi, my beautiful new daughter-in-law. Bobbi is such a lovely person and the reason I have such a big happy smile in all the wedding pics. I am overjoyed to have Bobbi in the family - she and my son are so happy together and good for each other. That they have made this commitment to each other by getting married has me as happy as a clam! This is the Leslie clan at the wedding. From left to right: My handsome hubby, myself, the bride and groom, daughter Katie and finally on the far right Barrie, my brother-in-law who came all the way from Quebec for the ceremony. My handsome son, Sean, the happy groom, after the ceremony. And here is the whole family: My son, Sean, my daughter-in-law, Bobbi, and my new grandchildren, Allie and Sam. How could I resist sharing this last photo of Sam? lol - isn't it a cute snap? !